Merry Christmas! Are you ready? Thanksgiving took me by surprise, but I think I’m prepared for Christmas. I confess, I cut baking out of my schedule a few years ago, and that definitely takes the stress level way down. One thing I love to do during the holidays is read Christmas-themed books. Because I review a lot of books, and this year I’m finishing up a novella, I’m behind on my list. I did set apart time to read one of our own, Kimberly Rose Johnson’s book, A Christmas Surprise. Veterinarian Pete Harding doesn’t date single moms. After showing up to a blind date to find he left before she arrived, Keira is reminded why she doesn’t date. She had true love once but a tragic accident ripped him from her and their son, who’s now four and only wants a puppy for Christmas this year. Although off limits since she’s a single mom, Pete determines to help Keira find the perfect puppy for her son. Keira wonders about Pete. He says he doesn’t date women with children, yet she can’t help but notice he behaves like a man who has more on mind than finding a puppy. Will love break down Pete’s walls and bring more than a puppy for Christmas? This was the perfect book to relax to in front of the Christmas tree with a cup of hot chocolate. Who can resist a romance with a child, a doctor, chocolate, and a puppy? I fell into the story right away as Keira is supposed to have a blind date, something she hasn’t done since losing her husband in a tragic accident. The date doesn’t come together, and they have missed cues every time they run into each other or make plans. Just when Pete and Keira seem to click, he learns she has a child. And that ends that. Or does it? This was a fast read with well-layered characters and great conflict. Keira has a fear right on the surface at all times, and Pete needs to get past the no children rule if he has any kind of future with Keira. It’s something I think translates well into real life, and their chemistry was believable. I loved the additional thread of Pete trying to find a perfect puppy for Cody. If you haven’t read this Christmas romance, or, if Kimberly Rose Johnson is new to you, check her work out! I know you will enjoy her writing. While I’m here, I have an extra copy of Engaged, and it isn’t doing me any good sitting on a shelf. This is the third book in my Surrendering Time series, but it can stand alone. I have one print copy available for one US winner. Leave me a comment on your favorite Christmas-themed plot or even Hallmark movie, and I’ll choose one random winner on December 23rd. In ENGAGED, Trish Maxwell’s back in Speculator Falls with egg on her face and a lot of apologies to make. She left the mountain town for her dream job in New York City, only to come back unemployed. With no prospects, she works at her family’s department store and makes amends as she finds a new passion creating window displays for Adirondack businesses. She works hard and tries to convince the people of Speculator Falls she’s changed for the better. Hi Julie, I’m almost finished A Christmas Surprise- the blind date set up was fun! Books/movies that reflect the true meaning of Christmas- Jesus, service etc. are my favourites. With the heavy focus on consumption, I am not really interested in books/movies that are all about getting/Santa etc. Doesn’t mean that they are not fun- just not my first preference to read/watch. I agree about the consumption too, Wimbledon. I loved the blind date, a disaster in the works! Have a Merry Christmas! I love the Christmas themed stories when they focus on the true meaning of Christmas, and involve children! Yes! Those are perfect. I love Christmas books like that. Merry Christmas! I like A Christmas Carol, the Crachett’s are poor yet they have such love and faith. Such a good story. My husband played Bob in a play, I will always think of him with that story. Merry Christmas Julie! 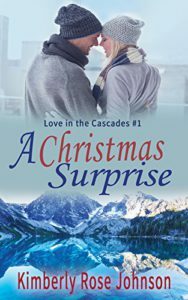 As a German American, I enjoyed Kimberly Rose Johnson’s holiday romance A Christmas Surprise because my husband had visited the quaint Bavarian Christmas village of Leavenworth, Washington – the story’s setting. I am always drawn to Christmas stories, especially those that have animals and children. Love seeing the delight of grandchildren during the holidays. Kimberly Rose Johnson weaves delightful puppies, a rambunctious preschooler, a fearful mom and a dateless veterinarian into an inspiring romance. This holiday season, besides reading all the wonderful Christmas stories by the talented Inspy Romance authors, my favorite series was The Twelve Days of Christmas Mail Order Brides set in Noelle, Colorado in 1786. Happy Holidays. Merry Christmas, Renate! I have never been to the West Coast, so I loved the setting to A Christmas Surprise. Have a beautiful Christmas! sounds like two hurting souls need some help. I love to read Christmas stories that involve the true meaning of Christmas being found or renewed. And if there are children and animals, well, that much better. Merry Christmas to everyone. May it be a blessed time for all. Lori, if you haven’t read A Christmas Surprise, I believe you will love it. If you like general romance with hurting souls in need of help, Entrusted is my first in the Surrendering Time series. They are all on Amazon, and Entrusted, Book 1, is a free eBook on juliearduini.com. Entrusted, Book 2, will be a free eBook December 26-28. Have a blessed Christmas! One Christmas themed book I enjoyed was one of Dan Walsh’s in which the mom is missing having her kids around for Christmas, and the dad manages to get them all home to surprise her. Margaret. I think I read that one. That’s a good one! Have a Merry Christmas! What a lovely surprise to wake up to this blog post. Thank you, Julie for your kind review! I’m glad you enjoy the book. :) Blessings and Merry Christmas. I’m very behind reading, but I love when I am able to, especially when the authors are right here. This was a terrific book. Have a blessed Christmas! I miss Hallmark! I get ION, but there movies didn’t seem the same. If you haven’t read book 1, Entrusted, that is a free eBook at juliearduini.com. Merry Christmas! Lucy, I agree. Those make the best books. Merry Christmas! Prodigal returning home for Christmas. That plot always gets to me. Yes, usually when a relative is in need, or, a high school reunion. I have A Christmas Surprise but it’s still on my TBR list. Hopefully I’ll get to it soon. 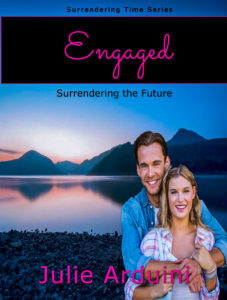 I haven’t read Engaged yet either but I see it’s available through Kindle unlimited so I’ll try to read it soon also. I think you will be blessed, Sherri. I believe my books in the Surrendering Time series are all on KU. I enjoy Christmas stories, even more so with children and animals. Thanks for this opportunity. I love to read Christmas stories, as well. They give you the feeling of Christmas in the air. They are comforting when you find a story where everything ends well and all are having a blessed Christmas. Thanks for the chance for a win. Merry Christmas. Merry Christmas, Donna! I love when you can read a story and feel the magic of Christmas. Kimberly’s book is one of my favorite Christmas books!! Her books are easy, fun, and encouraging reads with characters that I have fallen in love with, and am eager to see what happens next in their lives. Thank you for a fun post!!!! Yes, that’s exactly right! I feel the same way. It was a joy to read her work.